Top Texas Republicans met Sunday with Taiwanese President Tsai Ing-wen amid new tensions with China over the U.S. relationship with Taiwan, a country the United States hasn't officially recognized since 1979. Editor's note: This story has been updated with a statement from Gov. Greg Abbott. Top Texas Republicans met Sunday with Taiwanese President Tsai Ing-wen amid new tensions with China over the U.S. relationship with Taiwan, a country the United States has not officially recognized since 1979. Tsai stopped in Houston en route to Central America after leaving Taiwan on Saturday. Her trip came a month after President-elect Donald Trump took a phone call from the Taiwanese leader, upsetting decades of U.S. diplomatic protocol — and putting Beijing on high alert as she traveled to North America this weekend. While Trump did not meet with Tsai during her layover in Houston, two of the highest-ranking Texas Republicans did: Gov. Greg Abbott and U.S. Sen. Ted Cruz. Cruz said he huddled with Tsai against the wishes of the Chinese consulate, which he said sent a letter to the Houston congressional delegation asking members not to meet with her. "The People's Republic of China needs to understand that we make decisions about meeting with visitors for ourselves," Cruz said in a statement. "This is not about the [People's Republic of China]. This is about the U.S. relationship with Taiwan, an ally we are legally bound to defend. The Chinese do not give us veto power over those with whom they meet. We will continue to meet with anyone, including the Taiwanese, as we see fit." Cruz had defended Trump for taking the call with Tsai, suggesting the United States' One China policy — under which the U.S. does not maintain formal ties with Taiwan — was not "sacrosanct." Tsai has previously met with members of Congress while visiting the United States. In a tweet, Abbott said he met with Tsai to "discuss expanding trade and economic opportunities." More details on their meeting were expected later Sunday. Abbott's office said the two discussed energy, trade and other economic ties between Taiwan and Texas. They ended the meeting by swapping gifts: Abbott gave Tsai a clock with the Texas state seal, and she gave him a Taiwanese vase. 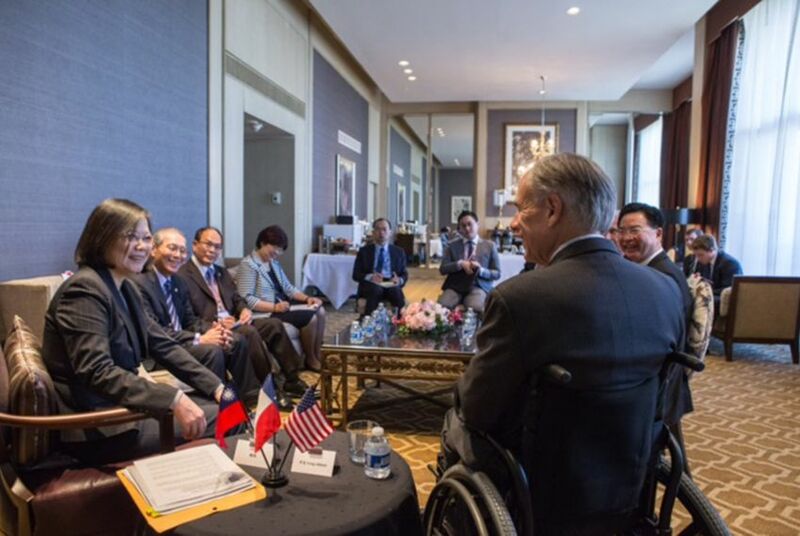 "I look forward to strengthening Texas' bond with Taiwan and continuing my dialogue with President Tsai to create even more opportunity and a better future for our citizens," Abbott said in a statement. U.S. Sen.Ted Cruz dismissed concerns Thursday about Russian interference in the 2016 presidential election, calling them an effort to undermine Donald Trump's victory. Gov. Greg Abbott paused a family vacation to Sydney in late December to meet with Australian Prime Minister Malcolm Turnbull.